The UK government is to formally adopt a definition of antisemitism based on the working definition of antisemitism adopted by the International Holocaust Remembrance Alliance on 26 May 2016. A Downing Street statement said the purpose of the definition was to “ensure that culprits will not be able to get away with being antisemitic because the term is ill-defined, or because different organisations or bodies have different interpretations of it”. "Working on the principle of consensus, the IHRA adopted the non-legally binding working definition on antisemitism as a sign of the great political commitment among IHRA Member Countries to combat antisemitism. With this working definition, the organization aimed to set an example of responsible conduct for other international fora and for national governments, hoping to inspire them to adopt a legally-binding working definition themselves. The IHRA considers it the obligation of all governments to actively combat antisemitism in all its forms. The IHRA’s founding document, the Stockholm Declaration of the year 2000, clearly states “With humanity still scarred by genocide, ethnic cleansing, racism, antisemitism and xenophobia, the international community shares a solemn responsibility to fight those evils. Together we must uphold the terrible truth of the Holocaust against those who deny it.” Read the full statement here. For more information, please consult the fact sheet on the working definition of antisemitism and the press release on the adoption of the working definition of antisemitism in May 2016. In October 2013 the IHRA's 31 Member Countries adopted a working definition of Holocaust denial and distortion. According to excerpts of her speech released in advance, Theresa May said: “It is unacceptable that there is antisemitism in this country. It is even worse that incidents are reportedly on the rise. As a government we are making a real difference and adopting this measure is a groundbreaking step. The UK Police College already use a version of the IHRA definition to help officers decide what could be considered antisemitism. Read more on the BBC and in the Guardian. The International Holocaust Remembrance Alliance unites governments and experts to shape and advance Holocaust education, remembrance and research world-wide, to speak out on Holocaust related issues including antisemitism, and to uphold the commitments of the 2000 Stockholm Declaration. 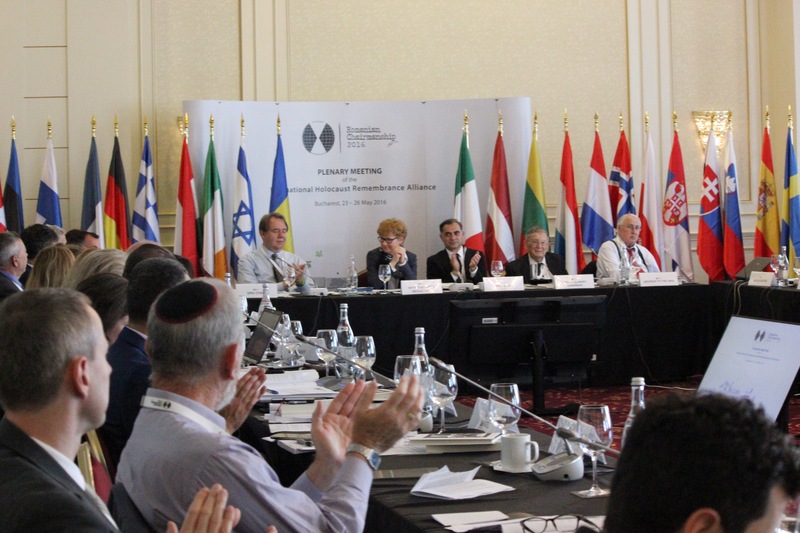 Image: Adoption of the working definition of antisemitism at the IHRA Plenary in Bucharest, Romania, on 26 May 2016.